Carriageworks’ 24 Frames Per Second is immediately immersive. The foyer portal to this monumental exhibition of dance and visual art collaborations places the viewer between two huge screens on which football fans coalesce into swaying masses or lock arms and glide in a sideways dance at speed in Khaled Sabsabi’s Organized Confusion. They chant, sing, raise fists and strip off their tops at the urging of a muscular shaven headed leader—just another man in the crowd standing on a fence. The rhythms of sound and movement are mesmeric, although a sense of the restless power of the largely male crowd disrupts reverie in this record of crowd loyalty for its team, the Western Sydney Wanderers. For all their activity, the fans are largely expressionless as they await play. For Sabsabi, their state is akin to trance. Bridging the screens with a series of engrossing near-still, black and white video portraits of Indonesian trance dancer Agung Gunawan, he creates a telling juxtaposition. Nearby, Brian Fuata’s mysterious Apparitional Charlatan…evokes in graphics, text and image fragmented memories from dance archives and of an empty, once-shared studio. These three works prepare the visitor for the diversity of works that lie ahead in a vast, dark space lit only by the glimmer of screens near and far, lining walls and, in the centre, inhabiting an intimate labyrinth. The great space largely allows works to speak for themselves without interruption while occasional seating offers opportunities for restful reflection and earphones greater intimacy. The installation is a wonder, offering moments of discovery and fascinating juxtapositions. Even after two visits for a total of some three and a half hours, I cannot do individual works in 24 Frames full justice nor can I cover all of them here. The number of works and their cumulative playing times prove a challenge, especially having to wait for long works to commence or finding one’s place mid-stream and returning later. Not all are narratives, but most have a structural logic which warrants sustained attention. There are works I’m drawn back to. Singaporean media artist Ho Tzu Yen’s 1 or 2 Tigers (We’re Tigers) takes the form of a magnificent ‘weretiger,’ at once human and animal. Created from animation and motion and facial capture, it growls out animist and other philosophisings. Although the tiger’s movements are minimal as the camera turns slowly about it and we voyage deep into one of its seemingly sad eyes, the work’s thoughtfulness and focused imagery are deeply fascinating. 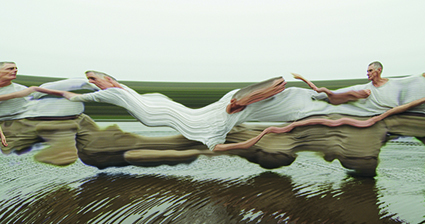 In White Record, Lizzie Thomson appears on an enveloping cluster of four screens. Accompanied by an engaging percussion track by Kevin Lo, Thomson offers a generous account of her personal archive of the jazz dance vocabulary in various permutations, from the intricately gestural to long loping walks captured in intimate detail by filmmaker Samuel James. The stark carpark setting and Thomson’s expression of deep concentration are reminders that jazz dance has long been abstracted into Modernist dance; but the artist’s movement subtly evokes the precision, energy and idiosyncracies of a vital legacy from black culture into white. Sri Lankan Sydney-based artist S Shakthidharan’s Emergence celebrates female Yolgnu dreaming with layered cosmological imagery on a large wide screen divided at times into a triptych of dancing women and other maternal images evoking the giants who created the world and the sacred knowledge that men then stole from them. Young Indigenous men are portrayed as being at risk in Tony Albert and Stephen Page’s Moving Target. Inside a gutted car in the 24 Frames exhibition space, smoke drifts on the video screens which have replaced the door panels and the inside of the boot. A young Aboriginal man, a red target painted on his chest, dances—agile, finely angular, proud, defiant—and then falls. The maintaining of cultural memory is also evident in the dancing of modern Berber women in Angelica Mesiti’s Nahk Removed, whipping their long hair to induce trance. Although the camera gradually pulls back to reveal limbs and faces, Mesiti is mesmerised by the hair—its length, textures, fluidity and especially its oceanic fullness when it fills the screen. Although beautiful in itself, the video might convey something trance-like but elides the real time power of the dance, the thrashing of the hair, because it’s shot in slow motion. In Silence is Golden (cinematographer Bruno Ramos), Australian Aboriginal video artist Christian Thompson honours his English grandfather by performing a Morris Dance. Eye to eye with us and at near human scale, he dances with commitment, simply and subtly evoking overlapping indigeneities. Challenges to the body are variously addressed. In Vicki Van Hout and Marian Abboud’s Behind the Zig Zag, glitches and stuttering pixelation yield richly coloured patterns. But these break up and compulsively loop the lyrical fluency of the sombre dancing. Projected onto the aged gallery wall, dance appears amid graffiti as just another piece of history done in by the digital. Kate Murphy’s complementary large screen works, Lift and Push, juxtapose senior dancers Robina Beard and Patrick Harding-Irmer engaging with an automated body lift and commode wheelchair respectively. Beard appears to try to make sense of the device in which she is suspended, reaching out, touching its surfaces; Harding-Irmer assesses his, hits it and climbs atop its armrests as if the chair is something other than it appears. Murphy empathically and patiently portrays bodies and minds challenged by age. Transferred from its performance staging to the screen, Branch Nebula, Matt Prest and Clare Britton’s Whelping Box expands, indeed queers, the realm of the Australian Gothic. Located in a mostly empty, aged house and surrounding claustrophobic bush, the film (cinematographers Denis Beaubois, Alexis Destoop) faithfully preserves the original’s brutal initiation of the human male into a surreal model of manhood. If less scabrously funny than the original, it’s a tense, finely crafted film with visceral impact. Climbing challenges a dancer in Alison Currie’s I Can Relate for which the screen has been sculpted into rounded outcrops that synch with projections of rocky landscapes across which the dancer slides, stumbles and clambers, if sometimes with dancerly poise. It’s an engaging 2D/3D conceit. In filmmaker Sophie Hyde’s immaculately produced To Look Away, variously abled dancers from Adelaide’s Restless Dance Theatre adopt fantasy personae in meticulously matching furnished rooms pictured across five screens. These evocative live portraits entail sustained ‘at home’ stillness, restlessness and casual dance. Of a small group of films in the documentary vein, James Newitt’s The Rehearsal, shot in a theatre in Portugal where the video artist from Hobart now lives, is the most interesting from what I manage to see of its 40 minutes. It records the making of a dance in which the bodies of trained and untrained dancers are subjected to increasing duress by choreographer Miguel Pereira. Positions are held and then slowly and sometimes agonizingly distorted. How the dancers accommodate this is revealing as is Pereira’s aim to create mental states to deal with the stress wrought by negative socio-economic conditions. Another senior dancer to appear in 24 Frames Per Second is Don Asker. In choreographer Nat Cursio and video artist Daniel Crooks’ at least for a while anyway, camera movement tracks left to right widescreen along a lakeside with its rushes and trees, until we reach a lone man, Asker, standing in the lake facing us. The camera moves on, the landscape gradually redistributed into striations of various greens, browns, blues and greys until the view is abstracted, although the water at times remains a ‘real’ if patterned presence. A hand pushes out between the lines and recedes, and then a leg, then head and shoulders, distorted like the melting limbs in Salvador Dali paintings but here coolly fluent, Asker stretching wide across layers of colour and over water in a series of supple moves. Asker’s dancing has been transformed, but the animation suggests agility, lyricism and even urgency. It’s one of 24 Frames Per Seconds’ best works. The ageing body emerging from and submerged in nature suggests a consoling and celebratory oneness. perform. She is seen in the distance, then closer, human scale, elegantly poised in a supple, lean ‘vertical’ dance, feet shuffling ever so slightly over the glass in order not to fall. She then towers powerfully over the viewer. Teshigawara in black, mouth taped over, is a dark presence who breaks glass and executes an idiosyncratic little semi-crouched dance, the opposite of Sato’s. Broken Lights suggests much, for example evoking the creative risk shared by choreographer and dancer, if moreso physically for the dancer working with a choreographer who breaks rules—the fragile floor whereon new dance is made and performed. 24 Frames Per Second has delighted audiences but also provoked discussion that it’s principally a visual arts exhibition, with dance fuelling the making but being less than evident in the end result, where movement is fragmented, treated and often slow-motioned—phenomena, of course, not uncommon to screen dance, but felt in that field to be in the hands of choreographers and dance filmmakers. Discuss. Which we should do as time passes, allowing for reflection. Congratulations to Carriageworks and its curators for an exhibition entirely comprising commissions of inventive collaborations and realised on a scale rarely seen in Australia, for installing it imaginatively and drawing attention to the multitudinous ways in which movement and screen can dance together.